This is a sustainable award created by Gaudio for the Michelmores Property Awards. With a sustainable award, you can expect the same high-quality design and manufacture, made with a range of sustainable materials. This award sees a stylish wooden tablet with layered detail. 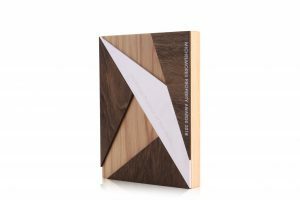 Triangles of dark stained plywood work in contrast with the light oak, for a stand-out design. As well as plywood detail we’ve also incorporated a piece aluminium for a professional twist. The aluminium is complete with a brushed finish and engraved detail, done in-house. Engraved detail, together with print, is an ideal personalization solution. We use UV-printing technology for colour-matched printing, which then dries instantly. For this award we used printing to emphasise the award title. Both the aluminium and the plywood use sharp lines to turn this tablet into something exceptional. Find out more about the award or plaque Gaudio can create for you. Call us on 01242 232 383. Alternatively, email sales@gaudio.co.uk, or fill in the ‘contact‘ form on our website. One of our Project Managers will be in touch to discuss your requirements.